Yes, his name is Black Fire and he is one of the undercover animals! These undercover animals pretend to be normal zoo animals, but they all have a special talent. These are the names of these strange animals: Black Fire, who is a lion and is never afraid; Storm Starter, who is an elephant who never gives up on a challenge; Bone Shocker, who is a monkey who leaves people in fits of laughter; Skull Crusher who is a vulture who is so strong he can crush skulls. And then there’s Bob, a very crazy zebra. They only keep him because he keeps everyone’s hopes up. Altogether they make the undercover animals! “Ahh!! !” cried Skull Crusher, “Angry kids at two o’clock!” This was a problem. Angry kids do mean things and these naughty girls started spitting at the animals, and then screaming at them as well. Bob didn’t know what to do and kept running up and down his enclosure, so Bone Shocker swung on his ropes to get to Skull Crusher and Storm Starter. “Guys, these girls are really upsetting the other animals. Something has to be done to stop them!” he said. Black Fire looked over at the girls and decided it had to stop. The undercover animals made a plan. They were going to teach these girls a lesson about being nicer to animals. Storm Starter and Skull Crusher decided to carry out Operation Distract and Soak. Skull Crusher started flying around her enclosure ready for attack, whilst Storm Starter filled her trunk with water ready to shoot. Skull Crusher distracted the girls by swooping down and pretending to attack them through the cage, whilst Storm Starter got into position. “Now!” screeched Skull Crusher. At that moment, a bucket full of freezing cold water shot out of Storm Starter’s trunk, soaking the girls at the front from head to toe. They ran away shocked and drenched! Meanwhile Black Fire and Bone Shocker began Operation Roar Banana. Black Fire strolled along the side of his enclosure trying to get some of the girls’ attention. As the girls got closer to the wall, he turned quickly to face them, and roared the loudest roar he had ever roared. The girls screamed in terror and started to run. As they ran past the monkey cage, Bone Shocker and all his friends threw mushy bananas at them. And to top it off, Bob stuck his tongue out at them as they exited the Zoo. All the animals looked up in relief. “Thank you! You are our heroes!” they said. The mean girls were taught a lesson. Never mess with the Undercover Animals! Shakira Bettencourt was the winner of our Writing Wizardry competition in 2016 with her wonderful short story Undercover Animals. 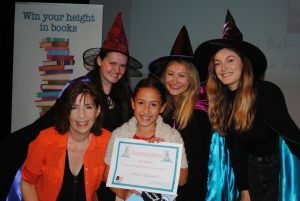 If Shakira’s story has inspired you to get writing and you want to be in with a chance of winning your own height in books, why not enter our 2017 competition? More information can be found here.